The most famous poker player there is. Every poker player respects Doyle. He is over 70 years old, but is still active in the largest cash game in the world and several tournaments like the WSOP main event. Doyle "Texas Dolly" Brunson was born August 10, 1933 in Longworth, Fisher County, Texas. A town with a population of around 100. Because of its small size Doyle ran long distances to other towns, and became a promising athlete. He was in the All-State Texas basketball team, and practiced the one-mile run to keep in shape during off-season. Brunson entered the 1950 Texas Interscholastic Track Meet and won the one-mile event. Allthough Doyle recieved offers from many colleges he attended Hardin-Simmons University in Abilene, Texas because it was close to home. The Minneapolis Lakers were interested in Doyle, but a knee injury would end his playing days. Doyle broke his leg in two places during a summer job and he was in a cast for 2 years. Occasionally he still needs a crutch to get around because of this injury. So Brunson had to switch from sports to education and got his master's degree in administrative education. Doyle started to play five card draw and he found it easy, and after his injury he started to play a lot more. After graduating in 1955 he took a regular job, but on his first day he was invited to play in a seven card stud game and earned a month's salary in less than three hours. Obviously he left the company soon after and became a poker pro. Brunson started his career in illegal cardrooms in Fort Worth, Texas where he usually played no limit hold'em. After building a bankroll there he became a regular in the $300 and $500 buy-in games in Texas, Oklahoma and Louisiana. Brunson's nickname, "Texas Dolly" was a mistake that stuck. Brunson should've been announced as "Texas Doyle", but Jimmy Snyder read his first name incorrectly and announced him as Texas Dolly. 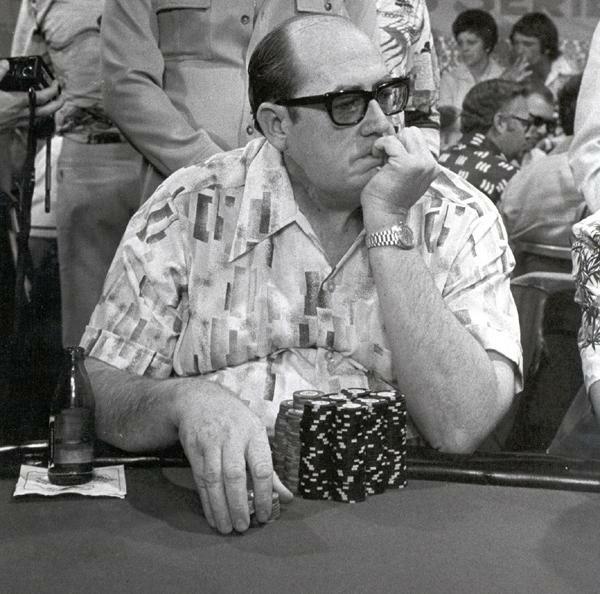 Now you're about to read an amazing story not many people know about: It's 1972, at the WSOP Main Event, the last 3 players were Doyle Brunson, Amarillo Slim and Puggy Pearson. Doyle and Puggy were worried about the amount of taxes they would have to pay if they won, so they offered Amarillo Slim (who wanted the title) a deal: Slim would bet on the river, and they would keep folding. After the game was over they would split the money between Doyle and Puggy. The plan worked, but Amarillo Slim wanted to make a big show from it, he kept showing his bluffs to the audience! If this main event would've been played properly Doyle probably would've had 3 main event titles. Recently, in 2005, Doyle won his 10th bracelet by winning the short-handed no limit hold'em event. However, Brunson still prefers cash games, even after the huge successes he had playing tournaments. Doyle is still a regular in "the big game" in Vegas, where a mix of fixed limit, pot limit and no limit games are played with $4000/$8000 stakes. Omaha eight-or-better, stud high, stud eight-or-better, 2-7 triple draw, hold'em, razz, omaha... Doyle started as a no limit specialist, but now he's truly an all-round poker player. THE all-round poker player.